Your Frequently Asked Questions (FAQs) answered by WVOHOA, we do not provide legal counsel, we do provide known information to increase HOA members’ knowledge. References to local, state and federal laws – in all cases the original document of record shall prevail. 1. What type of organization is WVOHOA? WVOHOA is a non-profit 501(C)3, registered with the West Virginia Secretary of State, WVOHOA cannot endorse legal counsel, businesses or political parties. 2. Who can join WVOHOA and how can my HOA become a member? Qualifications for membership are open to ALL functioning HOAs that are incorporated in the state of West Virginia as well as individual(s) and civic association(s). Bylaws were revised and adopted with a provision that all WVOHOA Members in good standing may vote. Contact: membership@wvohoa.org or select “About Us” for more information. 3. How much does it cost for membership to WVOHOA? 4. What if our developer has filed for bankruptcy and we don’t know what to do? Contact your County Commission/Council immediately. Contact your planning and/or engineering department(s) immediately. You must be prepared with copious notes, e-mails, telephone contacts, minutes, dates and times. Most important – always remain calm. WVOHOA has members who have experienced this issue (and other daunting challenges), won in County & State courts – our members are available to share their experiences and assist you – remember, WVOHOA cannot provide legal counsel. 5. What is the $64,000 question? Who really has the responsibility to read, review and qualify the approval of conditions & restrictions of the developer’s required covenants/servitudes in the first place? We cannot locate the approving agency/office that reads, reviews, and approves our HOA governing documents, e.g. servitudes”. All we can locate is the original attorney that drew up the document(s) in a popular cut & paste fashion – apparently a standard procedure. 6. I pay my HOA Annual Dues and my individual property taxes but the county and/or city never plows our roads, how come? JEFFERSON COUNTY: The Jefferson County 911 director, pursued through the former Traffic Engineering Director an exception and there are no route numbers on street signs in Jefferson County. As you stated, generally a green sign with white letters indicates a road in the WV State Highway System and brown signs are for private roads. However, we are aware that there are a few cases where the wrong color sign has been installed and we are working to have them corrected. As part of this exception, Jefferson County government maintains all of the street signs in that county. 7. Why is my HOA required to pay property tax on the Common Elements (roads, street lights, maintenance/replacement of roads, flood plain, etc.) when we pay for them in our HOA Annual Dues and our own individual property tax assessment? 8. When the County “floats a bond” for a developer to build an HOA subdivision just what does that mean? Simply put it is an IOU. For example, a developer requests and may receive from the County (and in some cases the state) a financial loan of a predetermined amount to fund (in whole or part) the construction of the subdivision. The IOU “bond” must be repaid by the borrower, the developer. When the subdivision is completed the developer holds no rights and you, the total of individual homeowners at large, are then considered the self-sufficient owner of the subdivision. 9. Did the WV State Tax Assessor ever reply to homeowners about taxing HOA common areas/elements? YES – units (your individual property & home) making up the condominium or planned community must be taxed and assessed separately, and the common elements may not be taxed and assessed separately. 10. What is the WVOHOA mission statement? WVOHOA is a cohesive force to protect the interests and welfare of home owners. Sharing information – increasing knowledge. 11. Besides Jefferson County are you going to add the other counties in West Virginia? The addition of West Virginia counties (and there are fifty-five) was certainly a goal and one in which is determined by education and outreach. 2010 began with Chapel View, a subdivision located within two counties, Berkeley and Jefferson. 2011 EPOHOA included the WV Eastern Panhandle of eight counties: Berkeley – Grant – Hampshire – Hardy – Jefferson – Mineral – Morgan and Pendelton. By October 2013 Tucker County was added. 2015 EPOHOA revised their Bylaws to include the outlying areas of the Eastern Panhandle of West Virginia.Thus Lewis county joined. 2019 the Organization, WVOHOA, went statewide, all 55 WV counties. 12. My HOA doesn’t show me the budget – how do I know what money is being spent or saved? Your HOA elected officers, your Executive Board, MUST provide a proposed budget prior to the date of your annual meeting so you can clearly understand the information. At your annual meeting you will have been provided a hard copy or even an overhead projection for the assembly of homeowners to see, with discussion and definition of line items. You participate in this presentation. You, the individual homeowner, must cast your vote for or against that proposed budget. You must be provided with a copy of the ratified budget. The following statute is/should be followed by all HOAs in West Virginia. It is your protection and the required transparency expected by all HOA individual property owners who are the voters. §36B-3-103. Executive board members and officers. (c) Within thirty days after adoption of any proposed budget for the common interest community, the executive board shall provide a summary of the budget to all the unit owners, and shall set a date for a meeting of the unit owners to consider ratification of the budget not less than fourteen nor more than thirty days after mailing of the summary. Unless at that meeting a majority of all unit owners or any larger vote specified in the declaration reject the budget, the budget is ratified, whether or not a quorum is present. In the event the proposed budget is rejected, the periodic budget last ratified by the unit owners must be continued until such time as the unit owners ratify a subsequent budget proposed by the executive board. 13. When I attend a monthly HOA meeting I am ignored and told by the Executive Board I cannot participate, how come? 14. Our HOA has a management company and they will not give me a copy of the minutes. How can I obtain the minutes of HOA meetings? We are assuming your HOA has been completed, and your developer has transferred the common area deed to you, the homeowners. State law is quite clear West Virginia Code Chapter 31E-15-1501 regarding what documents and information you are entitled to request from your HOA Board of Directors. Minutes of meetings are listed as one of the many documents homeowners can request. Remember – a management company, like any other contractor for an HOA, works for the Board, not the members. Unless an HOA directly hires employees and pays into unemployment and posts labor bonds, HOAs do not have employees. The Board is responsible for the actions of the contractors, including the management company. By the same token, management companies should freely share non-privileged information, but they cannot force the Board to respond. The Executive Board shall permit any unit Owner to inspect the minutes of Executive Board meetings during normal business hours. The minutes shall be available for inspection within fifteen (15) days [number of days are relative to the particular HOA and must be reasonable] after any such meeting. 15. I never know when our HOA meetings are let alone where they are – how can I find out about our meetings? Regular meetings are proposed for monthly, bi-monthly or in some instances just the Annual Meeting. For regular meetings each homeowner must have access to announcements of date, time and location. Your Executive Board (or management company) must provide this information either thru a bulletin board, newsletter, mailings or telephone calls, for example. Anytime the Executive Board meets that meeting is by law open to members entitled to vote, e.g. unit owners, and you may attend. The following statutes are/should be respected by all HOAs in West Virginia. It is your protection and the required transparency all voters demand. [for non-exempt Community Associations] A meeting of the association must be held at least once each year. Special meetings of the association may be called by the president, a majority of the executive board, or by unit owners having twenty percent, or any lower percentage specified in the bylaws, of the votes in the association. Not less than ten nor more than sixty days in advance of any meeting, the secretary or other officer specified in the bylaws shall cause notice to be hand-delivered or sent prepaid by United States mail to the mailing address of each unit or to any other mailing address designated in writing by the unit owner. The notice of any meeting must state the time and place of the meeting and the items on the agenda, including the general nature of any proposed amendment to the declaration or bylaws, any budget changes, and any proposal to remove an officer or member of the executive board. (a) A corporation is to notify members entitled to vote of the date, time and place of each annual, regular and special meeting no fewer than ten nor more than sixty days before the meeting date. Unless this chapter, or the articles of incorporation require otherwise, the corporation is required to give notice only to members entitled to vote at the meeting. 16. How come I cannot be in an Executive Session when the HOA Board calls one? Executive session(s) are off-the-record discussions and are closed to the public. No votes, no resolutions, no motions may occur on any issue being discussed, and there are no minutes taken during executive session. Executive Session is simply a chance for the HOA Executive Board to discuss an issue for clarification. 17. What’s the difference between a unit owner, a lot owner and a homeowner? I never know which one I am. NONE, no difference – when you purchase your property in a subdivision you are all three. 18. I don’t want to be a member of an HOA and my choice of home is in one. How can I not be a member? First – you cannot avoid membership when purchasing a home in a subdivision, e.g. HOA. Membership is automatic and shall consist exclusively of all the unit owners. That’s you, the purchaser of property within the subdivision – an HOA. 19. My car was damaged in an accident and I have it parked in my driveway – the HOA is threatening to have it towed, can they do that? Depends upon your governing documents. If your driveway is included on the deed to your property the HOA cannot trespass and tow your car. The DCCR rule “usually” carries a clause similar to no unlicensed unregistered vehicles may be parked anywhere within the subdivision. So if the damaged car carries current tags and license then you are in compliance. Always check your governing documents. Also, lets turn this around – consider the damaged car parked in your neighbor’s driveway, what action would you want of your neighbor as well as your HOA Board? It is important to look at all sides of any situation. 20. Is there any law to control or prevent ATVs in our subdivision? Check your governing documents, there may be a clause to regulate ATVs, you should also review the following state code . . .
(1) The governing body of a municipality may regulate in any manner or prohibit, by lawfully enacted ordinance, the operation of all-terrain vehicles upon any street, road or avenue within the municipal corporate limits. (2) Homeowner associations may petition the county commission of the county in which the area regulated by the homeowner association is located for an ordinance to regulate or prohibit the operation of all-terrain vehicles upon any street, road or avenue within the area regulated by the homeowner association. County commissions are hereby authorized, upon receipt of a petition authorized by the provisions of this section, to enact an ordinance regulating or prohibiting the operation of all-terrain vehicles. (3) The county commission of any county which has in effect and is operating under a countywide comprehensive plan may by lawfully enacted ordinance regulate or prohibit the operation of all-terrain vehicles on any road in the county, except interstate highways: Provided, That any county which enacts any such ordinance shall notify the West Virginia state police and all law-enforcement agencies in the county of its action in writing, together with a copy of the ordinance. 21. Everybody references orphan roads and HARP, what does HARP mean? 22. How many votes does it take to pass an amendment or the budget, etc. in an HOA? That depends on your governing document (s), some require 51%, 80% or more, and sometimes 2/3 of those present at a meeting. One of our HOA members provided their outline to demonstrate ” just how many votes are required ” using their own Declaration of Covenants, Conditions and Restrictions. Remember, not all DCCRs are the same. 23. Our HOA pays for our subdivision’s street lights as part of our annual assessment budget, who do we contact at the electric company to complain about irregular billing and off-the-chart increases? Concerns or complaints about First Energy [Potomac Edison] power company billing practices, you may file either an informal or formal complaint with the West Virginia Public Service Commission by calling . Also, at this writing [June 5, 2013] your issues may be e- mailed directly to Mrs. Charlene Gilliam, Director of External Affairs cgillia@firstenergycorp.com – remember to include your name, physical location, and telephone number. 24. My property may be taken by eminent domain for a new highway and I’ve heard folks talking about a “Pro Tanto Award” – what is that? Usually, after the government has determined that they will take your land via eminent domain, the government will appraise your property. They will then send you a notice with a pro tanto award. A pro tanto award is an offer on your property based on the appraisal. Some, not all people accept the pro tanto award, but you do not have to. You really must consult a real estate attorney to determine if you should accept or reject a pro tanto award. 25. What is a limited expense liability planned community? In West Virginia a “limited expense liability planned community” is referenced in the governing documents by Covenants that contain a cap on the annual assessment. Currently  the cap is $300, but it does not include insurance or optional use fees, such as trash service, etc. The $300 cap can be adjusted by using the Consumer Price Index and applying the formula in 36B-1-114 of the Act. Due to the complexity of the formula, only a certified public accountant, attorney or similar professional should calculate the adjustment. §36B-1-203 . Applicability to new common interest communities. — Exception for small and limited expense liability planned communities. Be alert – understand your governing documents, you may have a specific amount outlined in your governing documents though you may not necessarily be defined as a limited expense liability planned community. Not all governing documents are the same. 26. Does the WV Uniform Common Interest Ownership Act 36B protect an Association with 12 homes or less? Currently  if an Association in WV has 12 units or less, only two sections of the Act apply (36B-1-106 and 107). See 36B-1-102. §36B-1-106 . Applicability of local ordinances, regulations and building codes. 27. Does the WV Uniform Common Interest Ownership Act 36B protect a limited expense liability planned community? Only three sections apply (36B-1-105, 106 and 107). This is the exemption that most developers use to avoid the protections and restrictions of the Act. See 36B-1-203. §36B-1-105. Separate titles and taxation. §36B-1-106. Applicability of local ordinances, regulations and building codes. 28. Disclosure from developers, real estate agents and others is a big concern of mine; I’m seriously considering purchasing a home in an association somewhere in the countryside of West Virginia – what disclosure rules/laws should I be aware of? Chapter 36B has an entire section (Article) with detailed lists of items and documents that must be disclosed to purchasers. Unfortunately, that section does not apply to limited expense liability communities. See Chapter 36B, Article 4; and 36B-1-203. 29. I’m having trouble locating the WV website for 36B, can you help me? 30. I just heard [July 2013] Charleston passed a bill that urban agriculture is permitted and I want to take advantage of saving money by collecting my own eggs, however my governing documents state “No ponies, chickens, goats, or foul of any kind shall be permitted on the premises” so does this mean I can or cannot have my chickens? First, your governing documents have precedence – secondly, the Charleston Bill 7579 is specific to the city of Charleston, not the state of West Virginia. >>> Select: Bill No. 7579 Amending the Zoning Ordinance for the City of Charleston for the complete text. 31. I know that HOAs in West Virginia are governed by a lot of regulations, what exactly should I look for to understand the basic rights I could or should have? In addition to each unique set of governing documents, HOAs in WV are governed by the West Virginia Non-profit Corporation Act (Chapter 31E) and the Uniform Common Interest Ownership Act (Chapter 36B). Chapter 36B is HOA specific, but many subdivisions do not fall under this statute. If a community in WV was created prior to the adoption of Chapter 36B, then the Act applies. However, the Act does not override conflicting provisions in the governing documents of a preexisting Association. If there is a conflict, the governing documents of the Association take precedent. If a preexisting community changes their documents, then the changes must conform to the applicable section(s) of the Act. See 36B-1-204. 32. What is an optional service fee – does it include my HOA’s roads, school bus stops, mail box clusters and/or street signs? Basically, if the expense is something that the members are entitled to, such as use of the roads and common areas, it is not optional. 33. Is there a cost for WVOHOA’s workshops, and can members of non-WVOHOA associations attend? $20 per person: Non-member with RSVP registration no later than 10 days prior to a workshop or seminar. $25 per person: Non-member without RSVP registration. Cash or check accepted at the door – no credit cards. WVOHOA Workshops & Seminars typically include educational packets, handouts and light refreshments. Seating is limited, preference is given to WVOHOA Members in Good Standing. HOAs, Individuals and Businesses are encouraged to seriously consider WVOHOA Membership. Sharing information by increasing knowledge is the major goal of the WVOHOA workshops & seminars. 34. Why do homeowners always complain they have to increase their annual budget assessments after the developer/declarant transfers the common areas to the homeowners? The developer/declarant wears many hats, one of them is sales. When you purchase a home in an HOA it is important to the seller that you know there is a small annual assessment charged to you as a member each year. What you are NOT told is the true cost in relation to the long term, e.g. 20 – 30 – 40 years. Developers are not required to disclose that information to you, nor are they required to provide that information to local, county or state authorities. It becomes a guessing game of dollars and cents to the HOA. So what does it cost annually to maintain your common areas? $100/homeowner, $300/homeowner, or more? It’s pure speculation without a a reserve study. More often than not, no reserve study will be provided by the developer/declarant – the HOA must decide to be smart and pay (or do the leg-work) for a reserve study to learn what the projected costs are for maintenance of the common area, most importantly, roads. Sadly most HOAs limp along with band aid solutions for the long run so as to refrain from increasing the annual dues/assessments in support of maintaining common areas. It is the responsibility of the homeowners thru their Board of peers to provide the General Operating Expenses & Capitol Expenses Deferred Maintenance accounts, circulate that information and follow the budget to the “T” – by setting up a budget HOAs know and will expect the outcome. There are no secrets – it’s simply a fact of life. 35. This is so confusing – what are the differences between a policy a procedure and a resolution, let alone guidelines for HOAs? POLICY: A policy is a standard adopted by the Board that sets out the beliefs, values and objectives that causes the homeowner association to act. (such as a collection policy, an enforcement policy, or a conduct of meetings policy). A homeowner association’s policies communicate, organize, and focus the resources of the homeowner association. PROCEDURE: A procedure is the process that accomplishes a particular objective. For example, the homeowner association should have a clear and defined policy regarding assessment collection. The detailed steps of how this policy is achieved comprises the procedure of collecting assessments. RULE – REGULATION: A homeowner association’s board of directors adopts rules, regulations or guidelines to define desired behaviors and to set limits on allowable uses of the common elements and homes or units, architectural changes and the behavior of residents and guests. Some typical examples of rules include pets, parking, noise and use of HOA facilities. Specifications. A clear and complete statement on what those bound by the rule are expected to do. A north American & International organization dedicated to building better communities, CAI provides information, education, advocacy and resources to all community association stakeholders, including community managers and homeowner leaders. WVOHOA Board of Directors are members of CAI as well as many of our WVOHOA Members. 37. My neighbor mentioned anyone can make free calls to a bank of WV lawyers – is that true? Whether the caller really does have a legal problem. Whether there are some simple steps the caller can take to try to solve their problem without a lawyer. Whether the caller really does need to have a lawyer to help them. 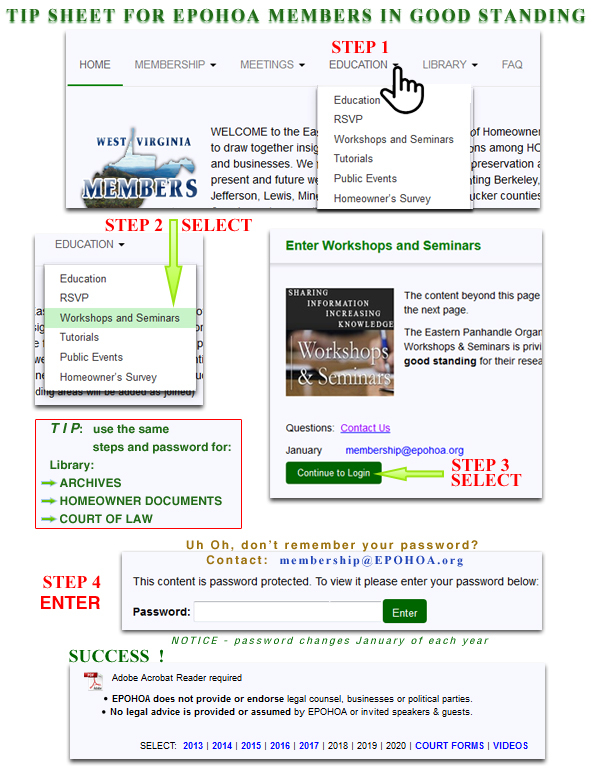 West Virginia Online Legal Help allows eligible users to post a legal question to a private messaging system. The questions are answered by volunteer attorneys. Users of West Virginia Online Legal Help can check the system for answers at any time. All information posted is held in strict confidence. West Virginia Online Legal Help is a project of the West Virginia State Bar. The website is administered by Legal Aid of West Virginia. 38. We are having serious issues in our association with homeowners and we just don’t understand the difference between negotiation, mediation or arbitration, can you please clarify this? OK, do attend WVOHOA meetings, we have several HOAs who could share their experiences on this important subject and might provide information that would be helpful. Civility is mandatory in all instances. To continue, you are referring to handling one or more conflict resolutions, this is also known as Alternative Dispute Resolution (ADR), which includes negotiation, mediation and arbitration. It provides HOAs with a means to resolve conflict more quickly, economically and sometimes more fairly than the traditional justice system. Negotiation is the first step in conflict resolution. It allows associations to work independently, requires the least amount of time and resources and does not require assistance from a professional mediator or attorney. Mediation is an informal, cooperative, problem-solving approach to conflict resolution. It relies on a trained third person (who has no personal stake in the outcome) to facilitate the negotiation. The mediator ensures constructive interchange between people and won’t allow the parties to stoop to adversarial posturing or name-calling. Mediated settlement agreements are created by the parties involved and aren’t legally binding unless formalized by contract or court order. Arbitration is a formal, rule-oriented process that is more expensive and takes more time than mediation, but less than a court case. In arbitration, a neutral party renders a legal decision based on evidence and testimony and makes a final award in favor of one party. The arbitrator’s office is quasi-judicial in nature, making final awards enforceable in court. The full explanation of this answer is provided by Community Associations Institute – ATTACHED for your convenience and continued reference. 39. What’s the difference between a regular board meeting, a members meeting, a special meeting, a committee meeting and an annual meeting? Regular Board Meeting usually monthly, bi-monthly and in some cases quarterly or every 6 months. Depends on the size and number of activities of your association. Your Board of Directors meet to handle the business of the association. You elected them from among your peers. As a member you must be provided with date, time and location so you can attend these meetings. Typically these meetings are for the Board (your peers) to make certain they are completing required time-sensitive fiduciary responsibilities governing your association. Members’ Meeting might be an informal gathering of two or more members that does not necessarily require advertising date, time and location to the full membership. Often members simply get together and discuss issues that they may decide to present to their Board of Directors. It is a relaxed environment and information is openly shared with those in attendance. It would be a good exercise to preserve notes or minutes of this type of meeting for future reference. Special Meeting is a formal activity for emergencies, you must be provided with date, time and location as soon as possible and you are encouraged to attend. An emergency situation may involve a one-time assessment increase of a sizable amount of money that must be obtained immediately. This is usually due to a major expense not outlined on an approved budget. It is a one-time vote of the members. Committee Meeting is a relaxed activity for a committee that has been delegated with a specific task by the Board of Directors and does NOT require advertising date, time and location to the full membership of the association. The committee meets when they agree to their own convenient time, date and place. They are responsible to carry out a specific task and report back to the Board of Directors. A committee is usually made up of 3 or 5 members. Some examples could be a policy committee, a website committee, a landscaping committee, or perhaps an architectural review or newsletter committee. There can be many types of committees in an association depending upon need. Annual Meeting is exactly that – once a year, typically outlined in your governing documents and certainly required by WV Law. Some HOA’s may call this meeting a Members Meeting, try not to be confused. The Annual Meeting must be advertised with date, time and location, too and including an agenda with a proposed budget for ratification, and a proxy form. At the Annual Meeting it is required to record & certify proxy forms, take written attendance, and the Board of Directors must present proof of notice. You are encouraged to attend the Annual Meeting. It is a corporation meeting of ALL MEMBERS once a year. If you cannot attend you should complete the proxy and transfer your right to vote at this meeting. 40. Do you have any information about Maryland’s HOA assessments?? 41. I’m a voting member of my HOA and at the Board meetings they won’t let me vote – can they do that? Purchasers in an HOA are automatically members AND they carry a vote; typically one vote one lot. However, you vote at your Annual and Special Meetings, they are the meeting of members. As a voting member, not on the Board (you voted from your peers at the Annual Meeting to elect your directors to handle the business of the association) you do NOT vote at a regularly scheduled Board meeting. A regularly scheduled Board meeting is specifically for the Directors to handle the business of the association during the fiscal year. The business of the association is the mandate your Board must follow by respecting the fiduciary requirements of your Declaration of Covenants, Conditions and Restrictions as well as your Bylaws and other guidelines, policy, resolutions and line item(s) of your approved budget. 1.) at the Annual Meeting members voted to obtain a snow plowing contract not to exceed $10,000 dollars for that fiscal year. 2.) at the regularly scheduled Board Meeting the officers voted to circulate a bid for proposals, the proposals arrived, the officers reviewed them, the officers voted to choose one contractor. Thus, they’ve satisfied the members’ vote by obtaining a snow plow contract – by handling the business of the association. also see FAQ# 13, 15 and 17. 42. What’s the difference between a director and an officer for my HOA? Board members, directors, officers, executive directors, directors at large are typically rolled up into one package. They handle the business of the association. Together they carry the same weight at regularly scheduled board meetings. The directors serve at the pleasure of the members. The officers serve at the pleasure of the directors. 5.) the newly elected board meets (usually at a later date) and they then elect their officers. 43. What actually is “servitude”? In a nut shell, when you purchased your home within a homeowners association you were automatically included as a voting member of that association. You voluntarily accepted the documents during settlement. With that membership you agreed to follow the governing documents, e.g. Declaration of Covenants, Conditions & Restrictions, Bylaws, policy, resolution and other guidelines of the association. The governing documents are THE association’s commandments you must follow. It is imperative homeowners read and understand governing documents. TIP: not all governing documents are identical for all homeowner associations. A servitude is a legal device that creates a right or an obligation that runs with the land or an interest in land. A real-estate development or neighborhood in which individually owned lots or units are burdened by a servitude that imposes an obligation that cannot be avoided by non-use or withdrawal. The recorded document or documents containing the servitudes that create and govern the common-interest community; e.g. you the homeowner. 44. I rent a home from an owner in the HOA, can I attend the HOA meetings? Depends on the HOA’s policy – typically, HOA meetings are for homeowners. However, the HOA should consider including renters, after all, renters aid in the continuing value of property. The governing documents must be followed, no matter if you rent or own. Without knowledge you cannot abide by the governing documents. Your landlord is required to notify the HOA of your contact information as a renter. A positive action on behalf of an HOA would be to welcome renters, encourage participation on volunteer projects while being a part of the community. Interaction is necessary for neighborly acceptance – meet your neighbors, follow the website, bulletin boards and/or newsletters, stay current. Renters represent their landlord’s property value while living in an HOA. 45. Is there a popular site for HOA news or information that may not necessarily be published in local papers for HOAs in West Virginia? National news too and including laws that have been added and/or updated specific to homeowner associations. 46. I just moved into an HOA and got elected as president at the Annual Meeting – I’ve never lived in an HOA or been an officer for any organization. Do you have any information to help me get started? Most important – thoroughly read all of your HOA’s governing documents, interact with the previous board of directors, ask them questions, know and fully understand your fiduciary responsibilities, read previous minutes and do make a point of meeting your fellow homeowners in your HOA. 47. Can the HOA Board have married couples? The Director and Treasurer are married. Also, two of the other Directors are married. Depends on your governing documents. If your governing documents do not prohibit married couples serving on the Board, it is best to have an internal policy or resolution against it to avoid the appearance of impropriety and potential conflicts of interest. With that said HOAs often struggle attracting volunteers to run for and be elected to the board. In the event a married couple is elected to the board from the same home/lot, Board votes should not be confused with membership votes. Each Board member (married or not) typically has one vote on any Board business. When it comes to general membership business, like annual meetings and elections, married couples typically get only one vote because their right to vote is linked to the one lot they own. Again, read and understand your governing documents. 48. My HOA was dissolved in 2008 by the West Virginia Secretary of State for failure to file annual reports and pay annual fees. For the last 5 years I get demand letters for money from the so called HOA but no name or signature. Now I get a letter that states “we will put a lien on your property if you don’t pay”. Why should this HOA have any right to demand anything if it was dissolved? Both points are required. The WV Secretary of State is required because HOAs are a business corporation . All WV HOAs must file every year no later than 5PM on the last day of June. When that filing does not happen the WV Secretary of State revokes the business corporation but NOT the HOA’s governing documents’ restrictions that run with the land that you must respect. Your governing documents outline the annual assessment in order to maintain the common areas; the amenities that you enjoy while increasing property values. That assessment is required. That assessment is a contract you agreed to when you purchased your home/lot. 49. My HOA won’t let me fly my flag – can they do that?? As far as the United States flag – HOAs CANNOT PROHIBIT FLYING THE US FLAG. Federal Law trumps your governing documents. TIP: your HOA may have guidelines that are specific to flag & pole sizes & location. 50. When a homeowner in our HOA has not paid their assessment we considered them NOT in good standing – can they still vote at the Annual Meeting? WV Code 31E does not allow for disenfranchising a member (i.e., not allowing them to vote). State laws supersede (trumps) covenants, bylaws and polices. This issue has not been addressed by the WV Supreme Court and it was suggested that to be safe not to disenfranchise members of your HOA. It was also suggested that your bylaws require all Board members and officers to be in good standing. Note that WV Code 31E implies that unincorporated organizations also must follow the code. (a) Unless the articles of incorporation provide otherwise, each member, regardless of class, is entitled to one vote on each matter voted on at a meeting of members. Voting rights of members of any class may be increased, limited or denied by the articles of incorporation. (b) Members otherwise entitled to vote, but disqualified from voting for any reason, may not be considered for the purpose of a quorum or of computing the voting power of the corporation or of members of any class. (c) A corporate member’s vote may be cast by the president of the member corporation or by any other officer of the corporation in the absence of express notice of the designation of some other person by the board of directors or bylaws of the member corporation. 51. I just learned the WV Attorney General’s representative said we can’t file a complaint as an HOA Board against a homeowner in our subdivision – how come? The short answer is an HOA is not a person, a human. 52. What is the difference between a lien and a super lien in an HOA? LIEN: an HOA Board may file a formal document thru their county clerk’s office on an owners property when there is a verifiable violation of the governing documents including delinquency of an owner’s contractual annual assessment, e.g. dues. Typically, the owner ignores all contact, warnings, hearings and pleadings from their respective HOA Board of Directors. This lien can only be released after payment is made by the owner to their respective HOA. The amount differs depending on a fine/penalty schedule the HOA has in place and the cost of filing with the county clerk, too and including the basic envelope, postage, and most likely attorney fees that may develop due to difficulty in correctly filing an initial lien. SUPER LIEN: same scenario as above except it goes to the next level of enforcement when an HOA Board forecloses on an owner’s property. West Virginia law, §36B-3-116. Lien for Assessments and Code §38.LIENS, supports HOA priority over first mortgage holders in this process. Thus, an HOA may recover an assessment. Do not take this action lightly – use of legal council is strongly encouraged. We’ve done a bit of research to respond to the SUPER LIEN explanation – read layman’s language “Mortgage Servicers’ Latest Troubles: Homeowners Association Fees“ by Kate Berry July 2011, and you might consider Matt Martin quoted in the article, he’s the CEO of Matt Martin Real Estate, in Arlington, Va., who established Sperlonga Data and Analytics LLC as a free service for HOAs to enable them to input documents into a portal and have the information sent directly to the servicer. At no cost, Homeowner Associations, Condo Associations, Cooperatives, and other types of Community Associations may register their communities at SperlongaSM. This data is used to quickly connect lenders and mortgage servicers with the associations in order to facilitate prompt resolution of delinquent association fees and to ensure all accounts are kept current. WVOHOA does not endorse or recommend legal counsel or businesses. WVOHOA is not affiliated with any political party. 53. I’m concerned about fracking in my neighborhood, what is the law if oil is discovered on my property, my land in West Virginia? The title is inchoate [e.g. not yet completed or fully developed] , and for purposes of exploration only until oil is found. There are no known decisions in which a West Virginia court has considered the enforceability of a consent-to-assign clause in an oil and gas lease. 54. I know WVOHOA cannot provide legal counsel or recommend an attorney for us, so how do I locate a lawyer for my HOA in West Virginia? There is a comprehensive listing online that provides links to cities and counties within the state of West Virginia to locate lawyers – you might try this website: West Virginia Dispute Resolution Lawyers . 55. Can WVOHOA provide the meeting dates to my HOA Board for a full year? Certainly, there are several ways to do this. register for news, information & updates. 56. I’ve been told my DCCR is simply an act of copy/paste from Virginia or Maryland DCCRs, is that true, is there a template developers’ lawyers used to produce the text for our HOA? It goes farther than just Virginia and Maryland, the suggested legal documents that developers’ lawyers may use is at the federal level. FHA Form 1400, VA Form 26-8200, Rev. October 1973. 57. My HOA wanted to print this page for reference but only the questions print – is there a way to print both the questions and the answers? Yes, open each question by clicking on the plus sign (+) then choose print. TIP: check your printer for plenty of paper. 58. We bought a pretty shed and had it placed in our backyard. Now our HOA says we are in violation and we have to tear it down. Can they really do that? Some, not all, governing documents in HOAs are specific to a structure’s materials, color, height, foundation, utilities, relative placement due to the proximity of a well or septic and may require a county permit. Governing documents may contain a clause that a shed must be a stand-alone structure or an attached structure to the home itself, or even an open wall structure. Some governing documents may state the number of windows, size of a door and possibly the number of stories (levels). You might also be asked if you are planning on storing explosive or corrosive materials in the shed due to restrictions in the governing documents. ASK before you do any structural changes/additions to be in compliance with the governing documents you agreed to follow when you purchased your home in an HOA. When ignoring your responsibility to follow your governing documents, then yes, you may be required to tear down your shed at your expense. SEMANTICS: A rose is a rose is a rose – the meaning most often attributed to this is the notion that when all is said and done, a thing is what it is. Governing documents typically spell it out, though many times the name of an thing is obscure and left to the reader to define, ergo – policy could be considered AND with a majority vote. 59. Really? Can drones be used in our HOA to spot violations? 60. I am a member of Community Associations Institute (CAI) and my HOA has found this organization to be very helpful. Is WVOHOA considering membership? On July 15, 2015 our Organization’s 5-member Board of Directors unanimously voted to join CAI. WVOHOA renews their CAI membership annually. Several of our members are also CAI members representing their own individual HOAs or as individuals or businesses. 61. In our HOA we have a homeowner who applied to the county zoning board for a Bed and Breakfast and they may be approved, however our governing documents are specific “residential use only”. Can the homeowner still convert their home to a B&B? Jefferson County shall not enforce or become involved in the enforcement of deed restrictions, covenants, easements, or any other private agreement, and, in the review of development proposals, the County will apply only its regulations to evaluate the proposal. All such restrictions shall be enforced by the parties to the restriction. It is the responsibility of an applicant for a proposed Cottage Industry or Home Occupation to research any private agreements relating to the subject property, contact the Homeowners’ Association, or seek the advice of a surveyor, engineer or attorney. TIP: open communication and transparency is key to success in any HOA – your HOA should be pro-active and encourage all their members to contact their Board of Directors prior to applying for any change that may/would be considered a violation of their governing documents – basically it is contract law – a homeowner accepted and agreed to abide by the governing documents, e.g. restrictions that run with the land, at the time of settlement. Without being pro-active, eventually your HOA will most likely seek legal counsel after-the-fact at great expense to all member homeowners and/or your HOA insurance. 62. We have a maximum limit on our annual assessments and we are trying to increase it over the $300, can somebody please tell me what is the CPI ? You’ve asked a very popular question! We will assume your HOA is a limited expense liability planned community which contains a requirement to follow WV Code 36B-1-114. also see FAQ #25, 26 and 27 above for reference. Consumer Price Index (CPI) data is provided by the U.S. Department of Labor, Bureau of Labor Statistic. WVOHOA had an important presentation in 2013 that included a practice budget using an excel spreadsheet. You might try playing around with your assessment figures and see how your annual dues might increase: PRACTICE BUDGET SPREADSHEET. Modify ONLY white cells in the spreadsheet. You might try the US Inflation Calculator – measures the buying power of the U.S. dollar over time. Just enter any two years between 1913 and now, a unique amount, then select ‘Calculate’. MOST IMPORTANT: Due to the complexity of the formula in WV Code 36B-1-114, be careful, only a certified public accountant, attorney or similar professional should calculate the adjustment. WVOHOA is not responsible for broken and/or expired links. The information found on the practice budget spreadsheet is intended to be used as a practice tool. No liability is assumed for the accuracy of the data presented or implied. Not responsible for results. 63. I was elected during our annual meeting but I am not clear how officers are elected. The previous officers were also elected again and I was told by the then president they discussed the officer positions they’ve agreed to remain in those positions. I was not included in that discussion. My question is how do I become an officer? To answer your popular question we will assume your HOA is compliant with all or parts of WV Codes 31E, 36B and your governing documents. 1.) During the Annual Meeting a list of nominees are announced and in some cases nominations from the floor are included. 2.) Nominees are then individually introduced; they express their reason(s) to be elected to the Board of Directors. 3.) Voting commences, winners are announced. 4.) The HOA then has a brand new Board of Directors. 6.) The HOA then has its fiscal year slate of Officers and those names, positions and contact information are circulated to all members of the association. The Board of Directors serve at the pleasure of the homeowners. The Officers serve at the pleasure of the Board of Directors. 64. One of our homeowners is on our Board and not well liked by our Board and some other homeowners in our community. Our Board made a motion and unanimously voted to remove this person from the Board and forever being elected in the future, can they really do that? While some, not all, governing documents contain a definition concerning members in good standing may cast a vote, we are unaware of HOA rules, regulations and laws preventing the entire membership of any HOA from voting for or against a homeowner based soley upon liking or not liking one or more homeowners by a Board of Directors or Officers of that Board. It is best to seek mediation, arbitration, and/or legal counsel in this instance. WVOHOA does not provide legal counsel. Be sure you review West Virginia §31E-8-809. Removal of directors by members or directors, and §31E-8-810. Removal of directors by judicial proceeding. 65. Our HOA budget has a line item for potential fines levied on delinquent homeowners if they pay their annual dues late so our budget looks healthier. Some of our homeowners argue that this is wrong – is it wrong? You cannot count “pie-in-the-sky income”, that’s like telling the finance company you should qualify for that million dollar loan based upon next year’s overtime at your place of employment. However, your HOA does develop a budget. An HOA budget consists of line items in real dollars typically based upon the previous year’s expenses and income. The HOA’s expenses and income must be made available to the members. Best policy: promote transparency. WV §31E-15-1502. Inspection of records by members. 66. Can our developer, he’s also the declarant, really own property in our HOA and not have to pay the annual assessment? (d.) someone has purchased property in your HOA who happens to be the developer/declarant. 1.) Anyone who financially qualifies can purchase one or more lots/homes in an HOA that is for sale. 2.) West Virginia §36B-2-107(b). Allocation of allocated interests. The declaration [your governing document] must state the formulas used to establish allocations of interests. Those allocations may not discriminate in favor of units [lots/homes] owned by the declarant or an affiliate of the declarant. WVOHOA is aware in some cases in West Virginia where property owners have been exempt in paying HOA assessments as part of the rights that run with the land – you MUST read and understand your own unique governing documents. Not all governing documents are the same. 67. What are the requirements for an HOA reserve study in West Virginia? I can’t find anything in my governing documents. Unit owners associations may adopt and amend budgets for revenues, expenditures, and reserves and collect assessments for common expenses from unit owners. Section 36B-3-102. Public offering statement must include the amount, or a statement that there is no amount, included in the budget as a reserve for repairs and replacement and statement of any other reserves. Section 36B-4-103. There is no statutory requirement to conduct a reserve study and no statutory requirement to fund reserves. WVOHOA NOTICE: Missing in West Virginia law concerning HOAs is declarant/developer disclosure for long term maintenance by providing a capital reserve study covering 10-20-30- years at minimum prior to the Deed of Transfer for the HOA’s common areas. 68. Our HOA received notice for delinquent tax owed by the developer on our common area and we were told if it wasn’t paid our common area would be sold at a tax auction – can our common area really be sold because of delinquent tax? Reference WV Code 36B-1-105 Separate titles and taxation. (c) Any portion of the common elements for which the declarant has reserved any development right must be separately taxed and assessed against the declarant, and the declarant alone is liable for payment of those taxes. Contact your county assessor for a resolution to the issue. If that fails, you will most likely need to retain legal counsel – to avoid obvious conflict of interest do not to use the same law firm as the developer/declarant. The burden of proof is typically on the challenger, in this case the HOA – research and gather all relative documentation. In some cases HOAs have paid the tax to prevent the auction tax sale. Do not give up. TIP: Each county recording office is a gold mine of archived facts. We suggest your HOA build a paper-trail timeline demonstrating events prior to, during and after receipt of the tax invoice. Retain duplicate copies of documentation and maintain a log of the HOA’s time & dates expended for research with the name & contact information of those assisting the HOA’s efforts. IMPORTANT: pass records on to new board members – transparency is key to success. 69. My HOA Board says that if we join WVOHOA we must follow your Bylaws and not ours, is that really true? NO, THAT IS NOT TRUE ! WVOHOA Bylaws are unique to WVOHOA only. HOA Bylaws are unique to the HOA only. Bylaws are developed by many corporations, agencies, federal, state & local government organizations, as well as homeowner associations, as guidelines to administer the business of the corporation, organization or association. 70. What does fiduciary responsibilities really mean? Fiduciary responsibilities are the operation of the business of your HOA by managing finances & maintenance, keeping detailed records and protecting the HOA with insurance (protection of HOA common area and the Board of Directors) is typically initiated by your HOA board of directors and in some cases by a management company. Unfortunately not all HOAs consider insurance a requirement. Serving on the Board can be an important way to impact and help maintain the well-being of your community while continually improving property values. Remember, to serve responsibly, and avoid potential legal liability, you must understand your unique governing documents to adhere to fiduciary obligations as an HOA Board member. These responsibilities MUST be forwarded to each Board of Directors every year. HOA homeowners rely on their board of directors to follow the required fiduciary responsibilities. Don’t drop the proverbial ball concerning fiduciary responsibilities because you may believe no one cares. 71. My HOA has been reviewing our governing documents and a section contains a private transfer fee, our Board of Directors wants to know what that is, can you help us? a private transfer fee covenant is attached to real property by the owner or another private party, frequently, the property developer, and provides for a transfer fee to be paid to an identified third party (such as the developer or its trustee) upon each resale of the property. The fee typically is stated as a percentage, such as one percent of the property’s sales price and often survives for a period of ninety-nine (99) years. 72. Because our HOA stopped doing the WV Secretary of State’s annual report, does our FEIN number go away, and do we need to file for a new one? FEIN is the same as EIN it is your federal employee identification number for the business (your HOA). It is never discontinued, reassigned or reused. Regardless of whether or not an EIN was ever used, the number is PERMANENT. An EIN cannot be canceled by the IRS; however, the business account associated with the EIN may be closed. If the EIN is needed in the future, it will still belong to the business entity (your HOA) even after the account is closed. 73. Our HOA treasurer said WVOHOA is a federal government agency – is that true? No, that is not true! WVOHOA is not a federal government agency. WVOHOA is an Organization exempt under section 501(c)(3) non-profit of the Code and is further classified as a private foundation. The IRS determined that WVOHOA is a private foundation under the Code section 509(a)(2). The mission of WVOHOA is built upon sharing information to increase knowledge among homeowners in homeowner associations in the state of West Virginia. 74. My HOA comes to my door over and over demanding I pay the annual assessment, I am tired of them coming over to my house, do you know how to stop them? uh oh – they cannot come a’ knock’in over and over, it’s harassment and a violation of the Federal Trade Commission Fair Debt Collection Practices Act. THE RULES: Fair Debt Collection Practices Act, www.consumer.ftc.gov/articles/0149-debt-collection. TIP: don’t forget, when you purchased your home in the HOA you agreed to pay your annual assessment when signing your settlement papers. For example, if you disagree with how your HOA may or may not be handling the business of the association, it does not justify withholding all or a portion of your required annual assessment. 75. What’s the big deal about hearings in an HOA? When the Treasure or Board of Directors does not receive your annual assessment after you have received your invoice AND you continually remain silent on the issue, they have no recourse but to provide you with a notice of a scheduled hearing. They must provide a date, time, and location of your hearing. You should attend to speak up for yourself, it is not mandatory. The hearing is confidential, no other homeowners attend. This is your opportunity to explain your issue, learn what the consequences could be, work out an agreeable plan and follow through with correcting your requirement of paying your assessment thereby halting a probable lien placed on your property. Remember, you’ve elected your Board of Directors to handle the business of the association and providing a hearing is but one instance of good business. CONFIDENTIALITY: The members of the Board of Directors learn personal information about residents during a hearing concerning covenant violations and past-due assessments. They must treat your information confidentially. They may NOT discuss information learned at the hearing outside of the hearing even with other board members. 76. We are a limited expense liability HOA and have been considering writing to our senator to get WV Code 36B amended and we need someone to help us prioritize our list, can WVOHOA help us? YES – joining WVOHOA is the first step – helping HOAs is exactly what WVOHOA does when we share information to increase knowledge! The list is extensive, we’ve provided the top six. 1.) Close the limited expense loophole in all fifty five (55) county ordinances by requiring the entire WV Code 36B apply, thereby restoring 36B to those limited expense communities that have been stripped of the Act’s protections. 2.) Require the declarant to provide detailed common area capital reserve expense planning related to 10, 20 and 30 year life expectancy. 3.) Require HOAs to file annual board member information with their respective county as well as the WV Secretary of State. 4.) Require HOAs to file annual financial reports based on the type of financial information that is required by Article 4 of WV 36B to be provided to purchasers before closing. 5.) Require full HOA disclosure (not just individual home disclosure of condition) to be provided to purchasers before closing. 6.) Require settlement attorneys to provide purchasers with the actual rights, responsibilities, and obligations of HOAs (not just the standard PUD paragraph that purchasers initial). West Virginia has not enacted one or more of these recommendations at this writing, June 2016. 77. My HOA Board says we don’t need E&O insurance, what is that exactly? E&O insurance is Errors & Omissions which is often misunderstood. It may include a claims-made form. E&O is a type of liability insurance that helps protect professional advice and service-providing individuals and companies from bearing the full cost of defending against a negligence claim made by a client, and damages awarded in such a civil lawsuit. Your HOA website makes a particular statement or promise that is misleading or in some way causes a visitor to make a poor choice or decision. Your HOA contractor fails to execute an order in a timely manner and a substantial loss results (this could be the project itself or the cost). 78. What are some of the comments/questions asked of WVOHOA at the annual home show? There are so many – we’ll provide several popular & persistent comments/questions received during past home shows. 1. Obtaining HOA governing documents was the most frequent request with a second being how to learn who the board of directors are from a particular HOA and what are their terms. 2. Homeowners do not know what a reserve study means and how/why it would be beneficial to their members and common areas. 3. Homeowners want to know how to get a hoarder to respond and bring their property into compliance. 4. Homeowners were generally dissatisfied with the lack of knowledge their HOA Officers demonstrated regarding violations, fines and “calming irate neighbors”. 5. Homeowners do not receive any training or HOA courses in learning how to operate the business of their association. They complain it is by “osmosis” they manage their association’s business. Always trial and error, though more errors. 6. Homeowners cannot receive guidance from local or state and nothing from their delegates or other elected office holders to aid them in answering questions after their development has been built out. 7. Homeowners want to know how to file harassment documents against an offensive board officer, including trespassing, removal & destruction of homeowner property and physical abuse. 8. Homeowners do not understand their fiduciary responsibilities, especially the requirement of filing with the Secretary of State or forwarding their own HOA responsibilities on to the next elected board of directors. 9. Homeowners did not realize that an HOA is NOT responsible for damage or poor workmanship by the builder to their individual property. That the Association is responsible ONLY for common areas. NOTICE: these comments/questions were from homeowners in single family & townhouse residential subdivisions. 79. Why does any HOA need Board of Director insurance? Liability is the big answer! Sometimes, homeowner-HOA disagreements result in lawsuits against the HOA. Not infrequently, such suits also name one or more HOA board members. Without adequate Directors and Officers (D&O) insurance, a lawsuit against an HOA board member can leave the member responsible for paying legal costs, expenses, and even damages. Since no prospective board member wants to risk going broke as a result of acting on the board, in order for an HOA to attract and keep good board members, adequate D&O insurance is a must. Learn why Directors and Officers (D&O) insurance is a must for homeowner associations. 80. I need something different & challenging to interest my board, any suggestions?? WVOHOA meetings are different and challenging, we encourage all members of HOA board of directors to attend, including their homeowners who may eventually be elected by their own members in the future. Downside: when just one director attends a WVOHOA meeting it is often difficult for that lone director to share information to increase knowledge and provide their written report back to their board. In the meantime you might try our crossword puzzle or leadership word search, both print on 8.5×11, and let us know when you’ve completed it. 81. Do HOAs have to pay tax on their saved capital expense account each year? Under US Internal Revenue Code 528, homeowners associations are exempt from taxes on income carried over, as long as at least 60 percent of gross income comes from membership assessments and 90 percent of that income is spent on maintaining the association’s property. 1976—Pub. L. 94–455, title XXI, § 2101(a), Oct. 4, 1976, 90 Stat. 1897, added part heading and analysis for part VII. 82. I am a committee representative for our HOA, do I have to provide a report to the HOA Board of Directors? Typically all committees should/must maintain and publish notice of their actions to unit Owners and the Executive Board. It is smart to provide written summary for the Board of Directors to include within the minutes as part of the permanent record of proceedings. For example, when your HOA Board appoints you as their representative to attend meetings outside of your HOA, e.g. WVOHOA, County Commission, Planing & Zoning or perhaps contractors being considered and yes, even state legislation assemblies, etc., representatives attend, like you, on behalf of their HOA. As your HOA representative, you agreed to attend related meetings and/or assemblies faithfully and with due diligence. We encourage you to always inform your HOA of date, location, subject, proceedings, and summary facts covered. Should handouts or materials be made available you should also bring those back to your HOA Board for circulation to your homeowner members. Sharing information is indeed increasing knowledge! 83. My HOA says we must have a fidelity bond, really? Fidelity insurance requirements protect association operating and reserve funds from inappropriate use, embezzlement or stealing on the part of board members having access. Community associations are required by law to have this coverage. The fidelity insurance policy should cover the maximum funds that will be in the custody of the owners’ association (or cooperative corporation) or its management agent at any time while the policy is in force. A lesser amount of fidelity insurance coverage is acceptable for a project if the project’s legal documents require the owners’ association (or cooperative corporation) and any management company to adhere to certain financial controls. Even then, the fidelity insurance coverage must at least equal the sum of three months of assessments on all units in the project. • Two members of the Board of Directors must sign any checks written on the reserve account. 84. Our HOA is confused about which court to choose for delinquent assessments – magistrate or civil? Some HOAs prefer magistrate court and may be successful, while attorneys representing an HOA will use a civil court. An HOA is not a person and must be represented somehow, that’s when attorneys enter into the situation. Don’t forget when a case involves real property, you must file in the county where the property is physically located. There are 158 magistrates in West Virginia, at least two in every county and ten in the most populous county, Kanawha County. They hear misdemeanor cases, conduct preliminary examinations in felony cases and hear civil arguments with $5,000 or less in dispute. Cases lost in magistrate court can be appealed to circuit court. There are thirty-one circuit courts in West Virginia with a total of seventy circuit judges. Circuit courts are West Virginia’s only general jurisdiction trial courts of record. They have jurisdiction over all civil cases totaling more than $300. Civil cases usually involve private property rights, not criminal activity. 85. What are the statute of limitations for assessment delinquencies in an HOA? W. Va. Code § 55-2-12 (1959) (Repl. Vol. 2000) provides, in pertinent part, that [e]very personal action for which no limitation is otherwise prescribed shall be brought . . .
(c) within one year next after the right to bring the same shall have accrued if it be for any other matter of such nature that, in case a party die, it could not have been brought at common law by or against his personal representative. 86. What are the most important points to begin writing a proposed amendment to our WV Legislators for our suggested text for 36B? Courtesy: David C. Hardesty, Jr., Introduction to Bill Drafting in West Virginia, 118 W. Va. L. Rev. Online 68 (2016); referencing Dr. L. Christopher Plein, West Virginia University College of Law. How do you frame the question(s) or define the issue(s) you are addressing? Why is (are) the issue(s) important now? Is legislative action the best means of addressing the matter(s)? What is the intent or purpose of your proposal? Can your proposal be informed by comparable actions taken on this or similar issues in this state or other jurisdictions? Are there potential negative spill-over effects or unintended consequences of your proposal that can be identified and addressed now? What is your time frame for realizing the policy? Does your proposal take into account the committee system, rules, politics, and traditional realities of the legislative arena? When is the best time to compromise on tough political issues? Does your proposal complement existing policies, institutional arrangements, and traditional practices? What types of findings, sanctions, remedies, and other tools will be used to encourage the changes you would like to see adopted? What objectives and benchmarks will be used to allow for future policy review and assessment? Is your particular policy proposal superior to other proposals designed to achieve similar concerns? 36B is the Uniform Common Interest Ownership Act that most, though not all, homeowner associations in West Virginia follow either in part or whole depending upon the choices of their Declarant/Developer when initiating the association’s Declaration of Covenants, Conditions and Restrictions. 87. I live in an HOA in Berkeley County and there’s a lot of low flying military planes over my house, do you have any information about them? YES – Colonel Shaun J. Perkowski, Wing Commander of the 167th Airlift Wing was one of our Organization’s guest speakers in 2016 and he provided attendees with the 167th Airlift Wing Flying Operations FAQs and answers. Why are the C-17s flying in the local area more than the C-5s did? Why are the C-17s required to fly at night? Why can’t you reroute flights to avoid residential areas? What other actions are being taken to help residents? How do I file a noise complaint? 88. Our HOA is considering a community fireworks display, are there any HOA requirements? WVOHOA has not tracked associations that put on fireworks displays, though it is a good future survey question to consider. However, we encourage any HOA to contact their insurance company, the local fire department and the city or county of their location for any requirements and/or guidelines that may be required. We also encourage HOAs to review their governing documents and consider developing a fireworks policy. 89. Are HOAs bound by the WV Open Meetings Act? The State statute on Open Governmental Proceedings, sometimes called the Open Meetings or “Sunshine” Act, was enacted to ensure that the proceedings of all public agencies are conducted in an open and public manner, so that the people may be informed about the actions of their governments and retain control over them. An HOA is not a public agency. Member homeowners, e.g. all unit owners within an HOA retain their attendance rights at board meetings and annual meetings with the exception of executive session. 90. What is the minimum notification for a board meeting? WV Uniform Common Interest Ownership Act §36B-3-108. Meetings. A meeting of the association must be held at least once each year. Special meetings of the association may be called by the president, a majority of the executive board, or by unit owners having twenty percent, or any lower percentage specified in the bylaws, of the votes in the association. Not less than ten nor more than sixty days in advance of any meeting, the secretary or other officer specified in the bylaws shall cause notice to be hand-delivered or sent prepaid by United States mail to the mailing address of each unit or to any other mailing address designated in writing by the unit owner. The notice of any meeting must state the time and place of the meeting and the items on the agenda, including the general nature of any proposed amendment to the declaration or bylaws, any budget changes, and any proposal to remove an officer or member of the executive board. COMMENT : not all WV HOAs enjoy the full intent of the law regarding §36B. HOA board of directors’ meetings are not necessarily noticed by a secretary through the US mail. Most HOAs post the time, date & location on a physical bulletin board, website or through e-mail. However, it is a requirement of an HOA Annual Meeting that notice be given through the US mail to all homeowners, e.g. unit owners. Most important – be familiar with and review your HOA governing documents. 91. My HOA is concerned about optional insurance coverage, can you help us? Is there anything on sinkholes? HOAs must have insurance and are sometimes unaware of optional coverage. We have provided a summary of non-definitive options. The attached article is in the public domain. It may help the reader to understand options by learning about Errors & Omissions (E&O) for their current HOA insurance as well as their members’ individual homeowner insurance coverage. WVOHOA encourages everyone to contact their own insurance carrier for information. Sinkhole insurance may not provide coverage for damages from mine subsidence, so be sure to review your policy carefully to see if you need additional insurance. Man made underground mines, including, but not limited to coal mines, clay mines, limestone mines, and fluorspar mines and recently fracking/drilling collapse. This endorsement provides coverage for direct loss caused by sinkhole collapse, and renders the basic policy exclusion of earth movement inapplicable to such an occurrence. Sinkhole collapse is physical damage suffered when underground action of water on limestone or similar rock strata causes the actual collapse or settlement of the earth supporting the damaged property. 92. HELP – I’m looking for how to handle delinquent assessments, I remember WVOHOA had a workshop on collecting delinquent assessments – did WVOHOA record what the lawyers went over? WVOHOA Members in good standing have access to workshop materials. 93. How do I log into the protected areas of the WVOHOA website – where do I get a password? Contact membership@wvohoa.org for the password to access protected areas of the WVOHOA website. Hurray – Success, you have access to previous education sessions, workshops and seminars including court forms & educational videos. 94. My HOA annual assessment keeps going up and I want to know how much it will really cost to maintain my HOA? First – you appear to have a Board of Directors that have knowledge and understanding by looking out for your property values and increasing your annual assessment each year. Unfortunately there is no WV disclosure law, at this writing , requiring a declarant [developer] to provide that critical information for you. The responsibility rests entirely on the shoulders of your Board of Directors. 95. How long can my HOA last? Any HOA, including yours, should last as long as the Board of Directors exists and follow the Declaration, the Bylaws and continue updating amendments, policies, resolutions and guidelines, e.g. governing documents. Enforcement depends on how well a Board of Directors remain dedicated to increase property values. At this writing [summer 2017] there are no WV laws to require a staffed state agency to enforce HOA’s to follow their HOA governing documents. Bottom Line: it’s all up to you, the homeowner, to make or break the longevity of your HOA. 96. We are having trouble locating CHAPTER 129 when reading Chapter 36B-1-201, can you help? I am having trouble locating CHAPTER 129 when reading Chapter 36B-1-201. 129 might be a typo or repealed, can you help me please? Except as provided in sections 1-202 and 1-203, this chapter [36B] applies to all common interest communities created within this state after the effective date of this chapter. chapter one hundred twenty-nine [§129], acts of the Legislature, one thousand nine hundred eighty , typo – repealed? As stated previously, the language highlighted above and found in current code 36B-1-201 refers back to a previous enactment of the Legislature. Acts of the Legislature 1980, Chapter 129 is the original enactment of Chapter 36B. As it was enacted in 1980, it was relating to the Uniform Condominium Act (which is separate and distinct from Chapter 36A, Condominiums and Unit Property). Chapter 36B in its current form, the Uniform Common Interest Ownership Act, was enacted in 1986. Acts of the Legislature, Chapter 164. The 1986 reenactment of Chapter 36B replaced the previous language, relating to the Uniform Condominium Act, in its entirety and renamed it the Uniform Common Interest Ownership Act. The 1984 date which you mentioned is incorrect. There was indeed a reenactment of Chapter 36B in 1984, which can be found in Acts of the Legislature 1984, Chapter 38, but the language then replaced the language first enacted in 1980, leaving it as the Uniform Condominium Act. 97. My HOA is not participating correctly with a couple of disabled homeowners – do you have any information that would convince my HOA to back off? Well this question is easy – though in some instances HOAs may not be fully aware. All HOAs should review whether their current insurance policies include coverage for fair housing claims. All HOAs must ask themselves what constitutes a “reasonable” accommodation. “For example, if an undue financial and administrative burden would be placed on the association or if the accommodation would fundamentally alter the nature of the association’s operations, the request can be denied. Whether an accommodation constitutes an undue financial or administrative burden will vary from case to case and will depend on a number of factors, such as the association’s financial resources, the benefits that the accommodation would provide, and the availability of alternative accommodations that may meet the person’s needs. With reasonable modifications, there must be a close relationship, or nexus, between the requested modification and the disability. If there is no such nexus, the association may be able to refuse to allow the modification. 98. Can my HOA refuse solar panels on my roof? Solar panels cannot be refused – BUT (yes, there is always a but) you must follow the HOA’s guidelines and that’s where homeowners receive approval or refusal. The most important practice of any homeowner associations’ Architectural Committee must be reasonableness. Typically, HOAs are responsible for developing solar panel guidelines, especially if and when they are not specifically outlined in the Declaration of Covenants, Conditions and Restrictions of which are generally aimed at restricting certain property uses of a homeowner and ensuring uniformity of appearance. Whenever a homeowner is denied installation of solar panels (or any other requests) the homeowner has every right to appeal, and yes, retain their own legal counsel. TIP: homeowners’ DCCRs, Bylaws and Guidelines outline time frames for particular actions to be completed, such as 30-60-90 days. 99. My HOA continues to use their actions on homeowner property citing an “emergency”. What exactly is an emergency in my HOA? “circumstances that could not have been reasonably foreseen which require immediate attention and possible action by the board, and by necessity make it impracticable to provide notice as required“. “IF” your governing documents do not address the issue of emergency, we suggest encouraging your board to consider an addition of text that is reasonable. And remember use of the words “emergency” and “action” must be clearly defined. All additions to your governing documents must be provided to all members of your HOA. 100. Do you have any examples of guidelines for solar panels? We have a recent example – it was involved in a law suit in California. This case is an example for non-Californian HOAs in West Virginia to develop guidelines for solar installation. West Virginia HOA law at this writing  is silent concerning HOA reasonable restrictions or prohibitions. This document is a reference – a model for content development for HOA solar installation restrictions. 101. I need to get to the bottom of this: who elects who and who serves who in my HOA? OK – lets outline this in the simplest way. The members elect the directors who serve at the pleasure of the members. The directors elect (and at times appoint) the officers who serve at the pleasure of the directors. CHAPTER 31E. WEST VIRGINIA NONPROFIT CORPORATION ACT. A layman’s explanation by Hughs Gill Cochrane P.C., California attorneys. WHAT’S THE DIFFERENCE BETWEEN DIRECTORS AND OFFICERS? TIP: follow your governing documents – not all governing documents are the same. 102. My HOA documents state my house’s paint must be an earth tone. What color is earth tone? review your HOA’s color pallet to select from. if your HOA’s governing documents are silent concerning color definitions ask your Board of Directors for clarification. A quick search online returned: Earth tone is a color scheme that draws from a color palette of browns, tans; any of various rich colors containing some brown. The colors in an earth tone scheme are muted and flat in an emulation of the natural colors found in soil, moss, trees and rocks. Earth tone colors come from natural things around us: brown soil, green leaf, sky, as well as the red sun. These palettes can create a warm, nature-friendly atmosphere. Natural tones are also considered “earth tones”. TIP: HOAs would be smart to include guidelines. Ambiguity exists in a document when a word, phrase, or provision in the document has, or is susceptible of, at least two reasonable but conflicting interpretations or meanings. 103. Do you have anything on West Virginia HOAs? WVOHOA’s Board of Directors is a member of Community Associations Institute. CAI has updated information including West Virginia within their Fact Book. We provide their fast facts on West Virginia. owners make in their homes and communities. model statutes that are the product of non-partisan, thoughtful deliberation. 104. I’m exhausted trying to figure out what my governing documents are, which one to follow, it’s a mess, can you help me understand? Many new homeowners discover they must follow their governing documents and they have no idea what they are let alone where to start. YOU can do the research or review the following basic paper trail your HOA Board of Directors should have in their files and provide copies to you upon request. This document and any additions to it is VERY important, it’s the beginning of the subdivision build-out, it had to start somewhere! Typically includes explanations concerning storm water, flood plain(s), historic markers, protected land & waterways, endangered species (flora & fauna) and a host of other restrictions & benefits that are not usually included in HOA documentation provided to each homeowner. * When you purchased your home in the HOA you should have been provided the Declaration from either the real estate attorney and/or the HOA itself. TIP: remain pro active – pass the Declaration on to the next purchaser when you sell your home. Amendments, policies, resolutions, rules, guidelines, procedures, applications, forms, etc. Remember: YOU are a member of the HOA and the Board of Directors is in place because you chose from your peers to transparently manage the business of the association for you. Board members are required to step outside their immediate circle of family and neighbors and make decisions based on the greater good of the community. 105. If we are Section 36(b) exempt, does the law require us to have a Capital Property Reserve Fund? Due to developer/declarant privilege to exempt certain HOAs from all but 3 sections (1-105, 1-106 and 1-107) of 36B, that exemption (1-203) causes great angst among homeowners and their elected boards to manage the business of their association over 10-20-30 years . TIP: law or no law – HOAs must be sustainable to preserve & increase property values. There is NO statutory requirement to conduct a reserve study and NO statutory requirement to fund reserves in West Virginia. 106. I keep calling the management company for our HOA about things I see in my community that are not taken care of – what’s the deal? Your HOA may have a contract that states only the board of directors interacts with the property management company. many more issues too numerous to name here. The property managers are agents, e.g employees, of the directors and the ultimate responsibility for making sure the common areas are properly maintained falls on the board of directors, NOT the property managers. Property managers should have an annual/quarterly or 6 month review ( just like you would at your place of employment). As an HOA Member it is YOUR responsibility to attend board meetings as well as notifying your board of directors with issues you are concerned about. The Board will contact the management company, it is the board’s fiduciary responsibility to follow through. 107. Isn’t it true that I don’t have to join my HOA membership because it’s voluntary? You voluntarily, without duress, purchased WV property, e.g. lot/home, in an association. Your property value includes your right to access the commonly owned amenities in your association. Your individual DEED and any restrictions recorded against your land control. Typically, your DEED states the association’s name, location, and any restrictions that run with the land you’ve purchased. You are automatically a member in your association. NOTICE: West Virginia associations developed prior to 1986 follow the WV Uniform Common Interest Ownership Act (§36B), with some exceptions. Optional membership is not listed as an exception. The association also follows the WV Nonprofit Corporation Act (§31E). 108. Is there a rule about my neighbor’s overwhelming outdoor hoarding? Each owner shall keep all lots owned by him, and all. improvements therein or thereon, in good order and repair, including but not limited to the seeding, watering and mowing of all lawns, the pruning and cutting of all trees and shrubbery and the painting (or other appropriate external care of all buildings and other improvements, all in a manner and with such frequency as is consistent with good property management. Borrower shall not destroy, damage or impair the property, allow the property to deteriorate or commit waste on the property. Borrower shall maintain the property in order to prevent the property from deteriorating or decreasing in value due to condition. 109. My HOA says because we are not covered by WV §36B we don’t have to keep minutes, is that true? (a) A corporation shall keep as permanent records minutes of all meetings of its members and board of directors, a record of all actions taken by the members or board of directors without a meeting, and a record of all actions taken by a committee of the board of directors in place of the board of directors on behalf of the corporation. 110. Can our HOA director, our Treasurer, be hired to do our common area landscaping just because they have a their own landscaping company? CAUTION be aware and be alert. This is commonly known as a conflict of interest. (your question did not include your HOA’s number of bids received on the job, let alone if the job was sent out for bids.) We will address the answer as if your director bid on the job and won the bid to do the work. (ii) the material facts of the transaction and the director’s personal interest are fully disclosed to the association’s directors, the transaction is just and reasonable as to the association, and the transaction is approved by the directors in good faith without the interested director participating in the vote. 111. One of our homes in our HOA was up for sale on the court house steps due to delinquent real estate tax but no person bought it, the state now owns it; who pays our required annual assessment then? The responsibility for payment of the annual assessment is the owner of record. 112. My new HOA Board of Directors said our old Board never filed federal tax, so they won’t either, is that true? 1. All associations must file a federal income tax return every year. The lack of taxable income does not eliminate the need to file, and filing a tax return does not necessarily mean that the association owes the government money. 2. A community association is generally required to file its federal income tax return as a corporation using Form 1120, but may elect to file as a homeowners association using Form 1120H, if it meets certain requirements. The association should consult its tax professional regarding this choice because tax rates are different. 3. A community association’s federal tax return is due the fifteenth day of the third month after the end of the tax year. It is possible to obtain up to a six-month extension of time in which to file a return. If an association needs an extension, it must file an extension request form and pay any expected tax due by the original filing deadline. 4. If previous boards failed to submit tax returns for previous years, the current board is not absolved from filing a return for the current year or for any previous year that was omitted. 5. An association may be required to make quarterly payments of its estimated annual tax, depending on the tax filing method it uses. When a tax professional prepares an association’s tax return, he/she will notify the association if it needs to make estimated tax payments for the upcoming year. 6. State income tax filing requirements vary from state to state. They are not necessarily the same as federal requirements. 113. Our HOA is having difficulty in the “business code” we are supposed to use in our WV SOS form, can you help? 2017 NAICS Manual. Typically amended on 5-year intervals. “8134 Civic and Social Organizations” which is a MEMBERSHIP ASSOCIATION. e.g. HOAs. This is the BUSINESS PURPOSE code the WV Secretary of State will use to identify your HOA. We have highlighted several areas in this NAICS document. WVOHOA does not and cannot enforce the use of any NAICS codes; we only provide known information. 114. Why are WV HOA’s required to file every year with the WV Secretary of State? All WV non profit, not-for-profit, non-stock HOAs are required to file with the WV Secretary of State. HOAs must collect the required annual assessment – the financial support for maintaining common area(s). WV Code 59-1-2a is specific: all activities engaged in or caused to be engaged in with the object of gain or economic benefit, direct or indirect. Furthermore: no corporation may engage in any business activity in WV without paying the annual report fee (currently $25/year) and filing the annual report as required in WV Code 31E Nonprofit Corporation Act. It is important for HOA Boards of Directors to maintain the good standing of their corporation, if they don’t have an active corporation that’s conducting the business of the association, there’s a potential for personal liability of owners and/or board members. An insurance company could say your association isn’t a valid corporation, so it can’t enforce any provisions in its governing documents, e.g. no coverage, no representation and/or no protection by the insurance company, no legal claim may be valid. 115. My HOA won’t do anything! Can the authorities take my home in my HOA without paying me because my renter was arrested for growing marijuana in the basement ? Your HOA cannot help you – it’s YOUR own individual property, your home. It is not the responsibility of your HOA. YOU are responsible for the actions of your renter. Civil forfeiture prohibits the government from confiscating property unless it can show “by a preponderance of the evidence” that the property is substantially connected to the crime. This is a much higher standard of proof than “probable cause.” If a property owner successfully challenges the seizure in court, the government has to pay legal fees. And if the confiscation causes substantial hardship to the owner, the government just may release the property. 116. Our HOA Board circulated new rules that are not in our governing documents, can they do that? “Unless otherwise provided in the governing documents” your HOA has the discretion to establish its procedures within its governing documents. For example, lets say that your Declaration of Covenants, Conditions and Restrictions specifically state all homes must have a driveway. Ask yourself does it include the length or width of the driveway? How about cement or blacktop or perhaps gravel? 117. What’s the definition of NUISANCE in an HOA? Ahhhh rubber words like nuisance is a challenge.